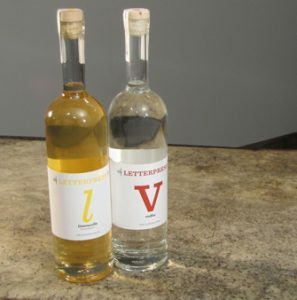 Letterpress Distilling is proud to be a premier producer of some of the finest domestic Italian liqueurs available. All of our products are made with extraordinary care and attention to detail. Take a sip and you’ll know. 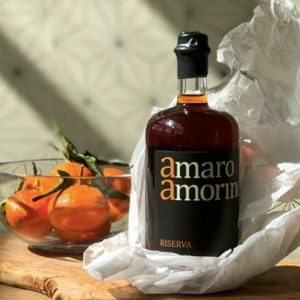 Amaro Amorino (ah-moh-REE-noh) is named for my grandfather, Amorino Pinti. Raised in a hillside village in Abruzzo, he went on to open a neighborhood liquor store in the heart of Rome. It was in that store that I learned about the way spirits and wine play a role in daily Italian community. “Amorino” means “little love” in Italian. As we all know, love can often be bittersweet. So I pay homage to that word and to my “Nonno Morino” with this bittersweet liqueur. It slots nicely into the light- to medium-bitter end of the amaro spectrum with a solid base of Seville orange peel bolstered by carefully balanced baking spice, earthy notes, and a distinct floral quality. This reserve variation on our standard Amaro Amorino is a special treat. Prior to sweetening the amaro, we finish it for six months in used American whiskey barrels at 100 proof. Bottled at 80 proof this is a more unified but aggressive cousin to Amaro Amorino. Amorino Riserva shows notes of cherry cola, lively spice, and a pronounced but approachable bitterness. Skip has been tasting limoncello around his family’s table in Rome since he was a boy. When he decided to start a distillery, he knew that he wanted to pay homage to those memories. Always looking for a way to make things better, though, Skip created Letterpress Limoncello to be “a perfect balance of sweet and heat,” as he likes to say, with a pleasant lemon finish. Letterpress Vodka is crafted from 100% Washington-grown soft white winter wheat and two-row barley. Distilled for exceptional purity, our vodka retains subtle chracteristics of the grain, exhibiting a soft vanilla on the nose and a crisp finish. Note: Our vodka production has been discontinued. We still have bottles to sell in the tasting room and, for now, you can find it at select Washington Safeways and all Washington Trader Joe’s locations. Our seasonal blood orange liqueur comes out every year in the spring. Like the limoncello, this liqueur is sweetened with honey and beautifully balanced. Unlike the limoncello, there is a pronouced orange character. Arancello Rosso is a natural in whiskey cocktails, as a Cointreau replacement in margaritas, or just as a delicious digestivo.